What is the goal of writing? I mean by this not only why do we, as individuals, write, I mean what is it we hope to do, to accomplish, by our writing. From my reading, I would say that one of the most common answers is: to entertain. And that makes sense. I think we've all had the experience of coming home from a hard day and wanting nothing more than to sit down and relax with a cup of steaming hot cocoa--or other beverage--and a book guaranteed to take your mind off the cares and troubles of the day. That said, I think it might matter what kind of story you're writing. For instance, someone who writes a literary story might be more interested in focusing on a particular aspect of the human condition than on entertaining their readers. I think all writers care about entertaining readers, it's just a matter of emphasis. So, tentatively, let's say that the goal of genre fiction (perhaps mainstream too, but certainly genre) is to entertain. But let's see if we can't narrow it down a bit more. First, though, let's take a look at what a story is at it's most fundamental level. "A speaker tells a listener what someone did to get what he wanted and why." Truby views a story as essentially interactive, something that passes from a storyteller to one or more listeners. "Good storytelling lets the audience relive events in the present so they can understand the forces, choices, and emotions that led the character to do what he did. Stories are really giving the audience a form of knowledge--emotional knowledge--or what used to be known as wisdom, but they do it in a playful, entertaining way." Truby calls stories verbal games. The storyteller constructs "a kind of puzzle about people" and asks the listener to figure it out. a. Give certain information about the characters to the audience. b. Withhold certain information about the characters from the audience. It is the interplay of (a) and (b) that keeps readers guessing up until the end. Question: What do you think the goal of storytelling is? 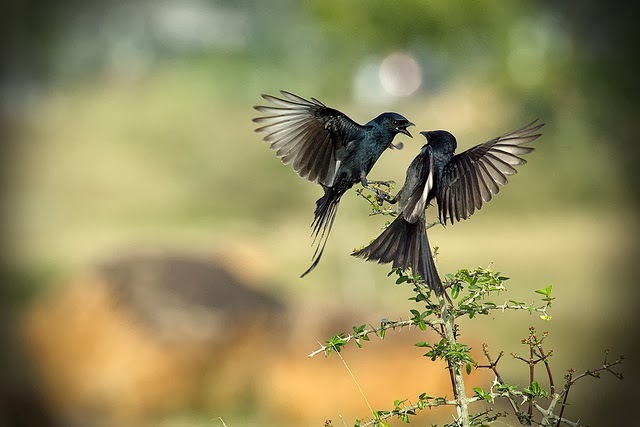 Photo credit: "♥ The Drongo Love ♥ Happy Valentine's Day ♥" by Vinoth Chandar under Creative Commons Attribution 2.0. The goals of writing are 1) to entertain, 2) to inform, or 3) to persuade. The goals of storytelling are 1) to entertain or 2) to inform. Accomplishing the first goal creates an emotional experience in the reader. Accomplishing the second goal creates an intellectual experience in the reader. Well said! As always, thanks for your comment antares. For me, as writer and reader, for literary and genre, it's what John Gardner refers to as the fictive dream that's important. To be completely drawn in, so I'm no longer consciously reading, but experiencing the story in an immediate, and immersive way. It's the fictive dream I'm looking for a reader and looking to provide as a writer. The latter is easier said than done of course. Ah yes, the fictive dream. A beautiful way of looking at it, thank you for reminding me. You inspired me to pull his book, The Art of Fiction, from my shelves. I'm tempted to call Gardner an accomplished writer but that would be like calling diamonds pretty. "... art has no universal rules because each true artist melts down and reforges all past aesthetic law."